AMD and Newegg's new promotion offers a free copy of Ashes of the Singularity: Escalation with the purchase of AMD FX-series processors. The hotly anticipated Ryzen processors are expected to start rolling out in early March, but AMD's still pushing its older FX-series chips folks looking to build a budget gaming PC. 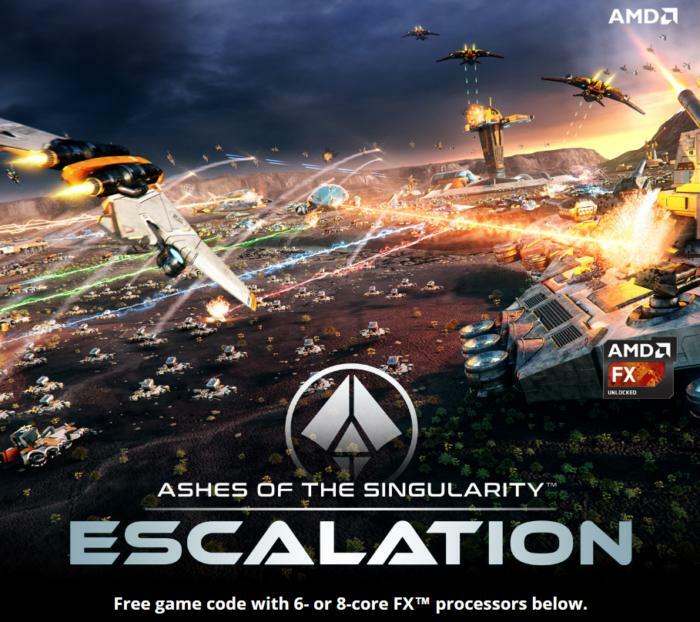 Newegg and AMD just revealed an FX processor promotion that bundles a 6- or 8-core chip with the real-time strategy game Ashes of the Singularity: Escalation, the poster child for cutting-edge DirectX 12 technology. The Newegg deal includes six popular FX processors ranging in price from $110 to $185, including the FX-6300, FX-6350, FX-8300, FX-8320, FX-8350, and FX-8370. The FX-8350 comes in the standard model for $140, or there’s a $160 version that comes with AMD’s swanky Wraith cooler. The FX-6350 and FX-8370 are also available with Wraith. This is the second major FX-series freebie revealed in recent months. In August, AMD bundled its processors with a copy of the then-newly released Deus Ex: Mankind Divided. The Stardock expansion to the original Ashes of the Singularity debuted in November 2016. While the original game was pretty darn good, the single player campaign left a lot to be desired. Escalation fixed those concerns and added additional polish to technical and gameplay aspects alike, such as ginormous maps, a strategic zoom view, additional units, and more. If you're an RTS fan, you'll love the complete package. The story behind the story: AMD no doubt has tons of FX processor stock it would like to get rid of with Ryzen right around the corner. However, this year’s lineup change isn’t your typical one for AMD. Despite the addition of Ryzen, AMD’s first Zen-based chips, A- and FX-series processors are sticking around. AMD hopes to broaden its lineup to better compete with Intel. As they are newer, Ryzen chips will be the premium CPUs, while A- and FX-series chips will be aimed at budget gamers and other computer buyers looking for a deal.